This recipe starts with a buttered pecan toffee made on top of the stove, which can be prepared several days ahead. A version of confectioners’ sugar frosting made with browned butter further accentuates the toasty, nutty flavors in this cake ball. 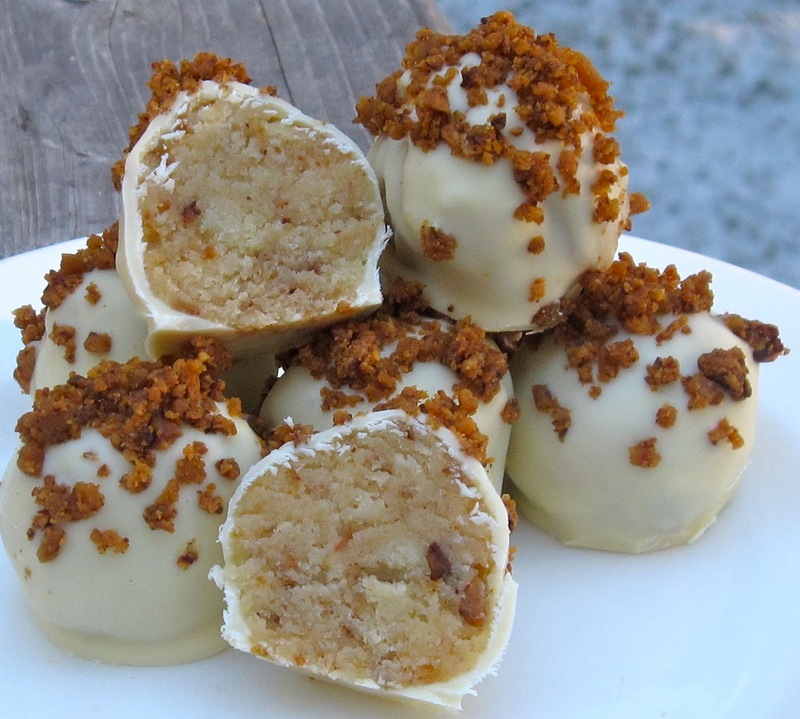 Of all the white chocolate–covered cake balls in the book, this one appeals most to even milk and dark chocolate lovers. I think the nuts temper the white chocolate’s sweetness, as does the browned butter flavor. 1. To make the toffee: Line a rimmed baking sheet with parchment paper or aluminum foil and spray with nonstick cooking spray. Melt the butter in a wide sauté pan, then stir in the sugar until coated (it will look grainy). Add the salt and pecans and cook over medium heat, stirring often, until the sugar liquefies and caramelizes and coats the nuts, and the caramel turns a dark toasty brown, about 3 minutes. Immediately scrape out onto the prepared pan and let cool completely. The toffee may be transferred to an airtight container and stored at room temperature for up to 3 days. When ready to use, transfer large chunks of toffee to the bowl of a food processor fitted with the metal blade and process until finely ground (you need 1 cup for the cake balls, plus a bit more for sprinkling on top). 2. To make the frosting: Place 4 tablespoons of the butter in a small saucepan and cook over medium heat until melted and browned, but not burned. It should turn a dark golden brown color. Let cool. In a medium bowl with an electric mixer on medium-high speed, beat the browned butter, the remaining 2 tablespoons butter, the sugar, milk, and vanilla until creamy, about 2 minutes, scraping down the bowl once or twice. 3. Combine the cake with 1 cup of the ground toffee and 1 1/4 cups of the frosting. Test by compressing and tasting and add more frosting only if needed for flavor and moisture. Roll into golf ball–size cake balls. Refrigerate until firm. This can be done 1 day ahead; store in an airtight container once they are firm. 4. Line two rimmed baking sheets with parchment paper or aluminum foil. Melt the chocolate in the microwave or a double boiler. Dip the balls one at a time in the chocolate, encouraging any excess chocolate to drip back into the container. Place, evenly spaced, on the prepared pans. Sprinkle a bit of ground toffee on top of each cake ball while the chocolate is still wet. Refrigerate briefly until the chocolate is set. Trim the bottoms, if needed. Place each cake ball in a paper cup, if desired. Place in a single layer in an airtight container and refrigerate for up to 4 days. Bring to room temperature before serving.